This week I’ve been busy working the Salem County Fair, so I haven’t had my usual time for daily cooking. 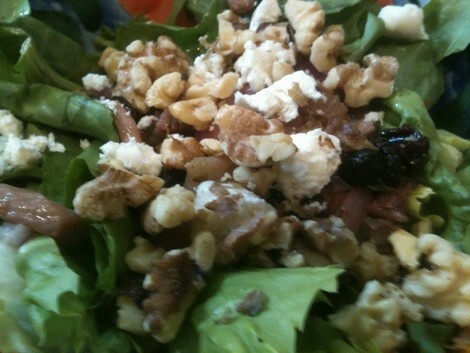 It’s also been so hot and humid outside, I’ve been craving cool summer salads and meals to enjoy – either packed up in my cooler to eat at the fair, or when I get home at the end of the evening and just want a light bite before bed. 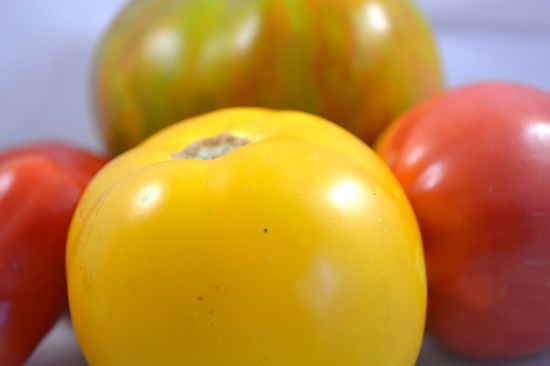 Yesterday one of my neighbors brought over some beautiful yellow and variegated tomatoes from his organic garden – it seems none of us right now have any shortage of beautiful tomatoes this season. I’d just gotten the newest issue of Food Network Magazine and of course, the current cover recipe was a stunning-looking Tomato “Caesar Salad”. I just had to try it out for dinner and overall thought it was quite nice – although I may tweak the details next time to give it more of an actual “Caesar Salad” taste. 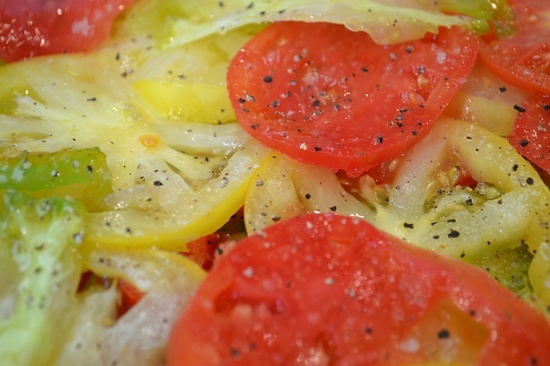 The tomatoes are thinly sliced and mixed with a dressing of anchovies, olive oil, salt pepper, lemon and Worchestershire sauce. It’s early May and what’s glorious is seeing the first of the spring and summer local fruit hitting the farm stands of South Jersey. There’s nothing like fresh spring strawberries, and I got an overflowing basket of them this morning from my nearest farmstand today. They had just been picked that morning. 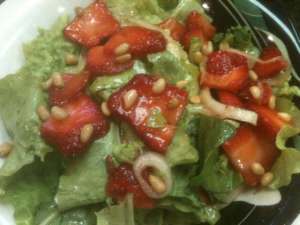 So what could be better for lunch than a strawberry salad, featuring the first pick of butter lettuce from my own garden? Tossed with toasted pine nuts, sliced onion, and a quick honey vinaigrette, it was just divine.